The origins of the company date back to 1836, when David Sprüngli-Schwarz and his son Rudolf Sprüngli-Ammann bought a small confectionery shop in the old town of Zürich, producing chocolates under the name David Sprüngli & Son. Two years later, a small factory was added that produced chocolate in solid form. In 1845, they moved to the Paradeplatz. With the retirement of Rudolf Sprüngli-Ammann in 1892, the business was divided between his two sons. The younger brother David Robert received two confectionery stores that became known under the name Confiserie Sprüngli. The elder brother Johann Rudolf received the chocolate factory. To raise the necessary finances for his expansion plans, Johann Rudolf converted his private company into "Chocolat Sprüngli AG" in 1899. In that same year, he acquired the chocolate factory of Rodolphe Lindt in Bern, and the company changed its name to "Aktiengesellschaft Vereinigte Berner und Züricher Chocoladefabriken Lindt & Sprüngli" (United Bern and Zurich Lindt and Sprungli Chocolate Factory Ltd.). 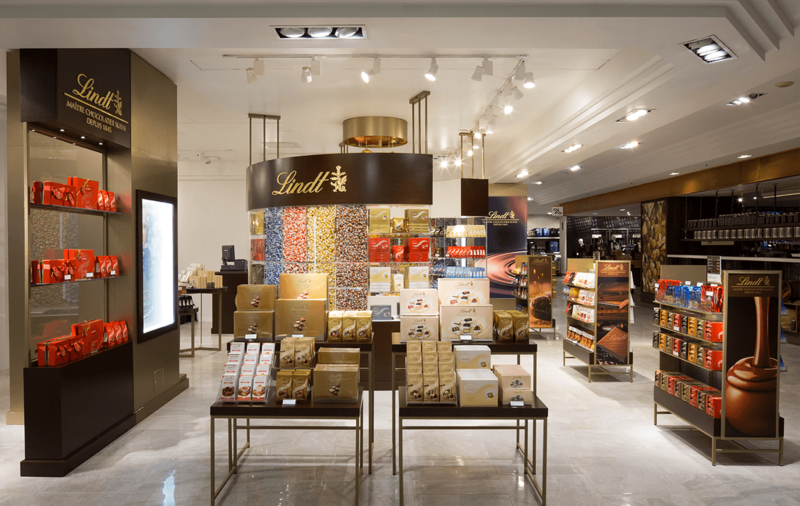 Lindt engaged BGI to create a new shop-in-shop experience at HBC Queen St. This is part of a new initiative called the Sugar Shack which HBC is expanding nationally based on results from their German Retailer Kaufhof. When Lindt presented the opportunity to bid on this project we jumped at it as it was completely in BGI’s wheelhouse, touching every department in the process. The conceptual rendering drove their confidence in our ability to understand their needs and design their vision. Once they toured our facility they were very impressed with our capabilities and have since engaged BGI in other programs. The conceptual rendering drove their confidence in our ability to understand their needs and design their vision. Our renderings depicted what we designed and senior executives were holding up the rendering to the finished space for comparison and said “BGI knocked it out of the Park”. 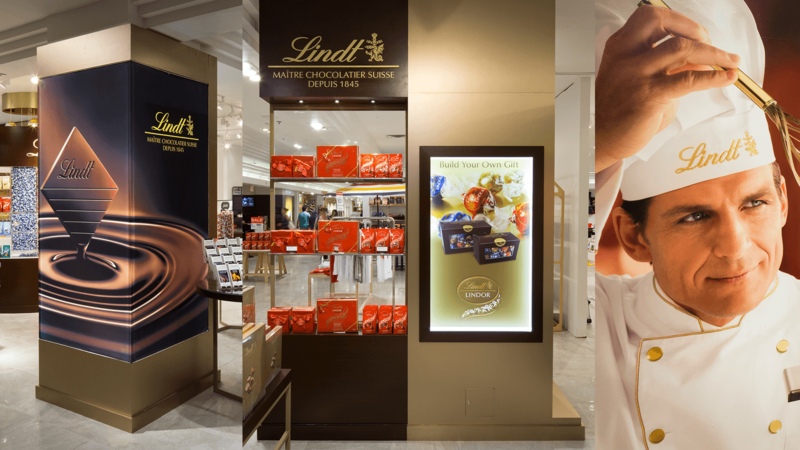 We designed the curved Lindor Bulk Truffle Wall that became the anchor to the SIS and the focus of this concept to draw the customer into the space for the Lindt experience. There was a noticeable increase in sales from previous and Lindt has since engaged BGI in Holiday graphic programs and National fixture rollouts for grocery.